Sheffield City Council recently received a £1.8m funding boost courtesy of the Arts Council specifically to create a ‘music hub’ – a composite of people, projects and events designed to assist more young people into playing music by providing music opportunities across the city. Comprising elements from the Council’s music service, plus music organisations, schools, teachers, parents and young people, the new Sheffield Music Education Hub seeks to research and deliver the best music opportunities available, including musical ensembles, singing, instrumental lessons, events and more. The project was launched in fine style at a special concert which took place in March at the Irwin Mitchell Oval Hall, one of three venues within the Sheffield City Hall complex. 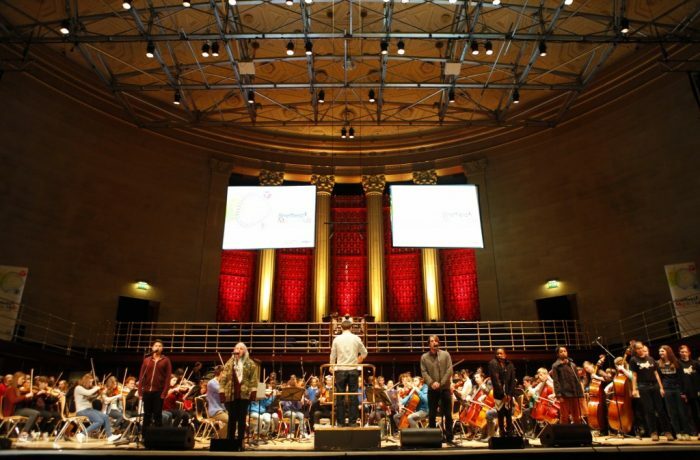 This unique event showcased a diverse range of young musicians from across Sheffield in a variety of Music Hub ensembles including a choir, an orchestra, jazz and string ensembles, a composers showcase (Powerplus project) a rock band, an organist and a percussion ensemble from Bents Green special school. Pro Audio Systems deployed a sound reinforcement system based around Meyer Sound components including two 700-HP subwoofers plus four each UPA-1Ps, UPA-2Ps and UPM-1Ps respectivly, all controlled by a single Galileo 616. The system was designed using Meyer Sound’s MAPP Online prediction program, and was was driven by a Yamaha M7-CL console. Microphones included various models from AKG, Audio Technica, DPA, Neumann and Sennheiser, while stage monitoring was handled by Martin LE1200 enclosures driven by Lab Gruppen amplifiers. Circumstances and the fast-paced nature of the event necessitated rapid changeovers between acts, with very little rehearsal, soundcheck or rigging time before showtime. The Meyer system’s predictable and linear performance prevented the time constraints from being any problem, remaining accurate and natural for classical music but with enough punch to handle contemporary material. The optimum system placement was calculated in advance by using MAPP Online, so onsite deployment was quick and simple.